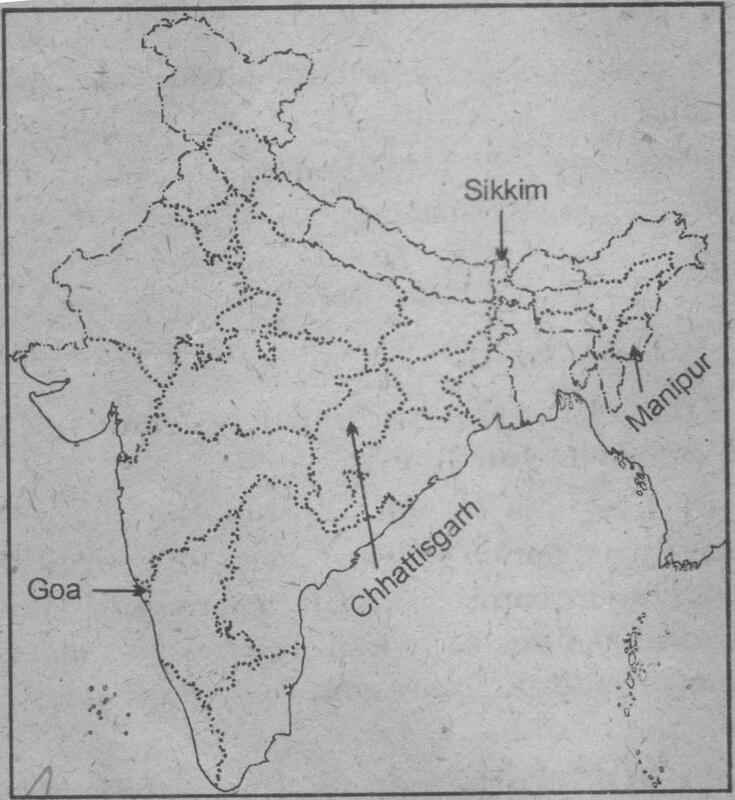 Question 1: Locate the following states on a blank outline political map of India: Manipur, Sikkim, Chhattisgarh and Goa. 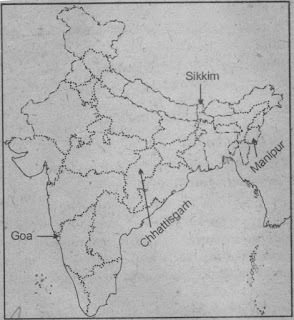 Question 2: Identify and shade three federal countries (other than India) on a blank outline political map of the world. Question 3: Point out one feature in the practice of federalism in India that is similar to and one feature that is different from that of Belgium. I. Similar feature: Both Belgium and India have a three-tier government. II. Different feature: In Belgium, there is a community government as the third tier, while, we have a local self-government (not based on races / castes) in India as the third tier of the government. Question 4: What is the main difference between a federal form of government and a unitary one? Explain with an example. I. In federal form of government, power is shared at different levels, for example, at the organ level, such as among executive, legislative and judiciary; at the different levels of government such as state government, central government, local government, etc. The examples of federal form of government are India, Belgium, USA, Australia, etc. II. On the other hand, in unitary form of government, the national government has all the powers. If there are other levels of the government, they are either sub-units or subordinate to the national government. The states or provinces have to follow the orders of the national government. The examples of unitary form of government are Sri Lanka, China, etc. Question 5: State any two differences between the local government before and after the Constitutional amendment in 1992. 1. Elections to the local governments were not held regularly. 1. It has been made constitutionally mandatory to hold regular elections to the local government bodies. 2. Local governments did not have any powers or resources of their own. 2. The state governments are required to share some powers and revenue with local government bodies. Since, the United States is a _______ type of federation, all the constituent States have equal powers and States are __________ vis-à-vis the federal government. 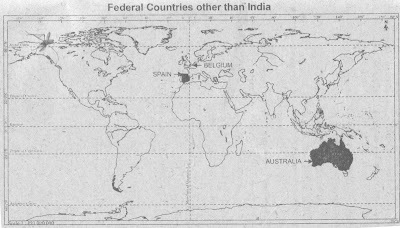 But India is _______ type of federation and some States have more power than others. In India the _______ government has more powers. Answer: coming together, strong, holding together, central. Question 7: Here are three reactions to the language policy followed in India. Give an argument and an example to support any of these positions. Arman: Language based states have divided us by making everyone conscious of their language. Answer: I will refer to go with the rea ction of Sangeeta that the policy of accommodation has strengthened national unity. Initially, Hindi was made official language of the country and later English was stopped from being used as an official language. This hurt the feelings of many in the southern states of our country. The example was Tamil Nadu, where the resistance became violent. We are, in fact, a diverse country where more than 114 major languages are spoken. We should have respect for each of these languages. In contrast, we have example of Sri Lanka, where linguistic differences have led the country to a state of civil war. But our policy of accommodation has helped to make our linguistic heritage rich administration of states easier and also ensured a larger participation in Government’s activities by people who speak various languages. a. National government gives some powers to the provincial government. b. Power is distributed among the legislature, executive and judiciary. c. Elected officials exercise supreme power in the government. d. Governmental power is divided between different levels of government. Answer: d. Governmental power is divided between different levels of government. Question 9: A few subjects in various Lists of the Indian Constitution are given here. Group them under the Union, State and Concurrent Lists as provided in the table below. A. Defence; B. Police; C. Agriculture; D. Education; E. Banking; F. Forests; G. Communication; H. Trade; I. Marriages. Question 10: Examine the following pairs that give the level of government in India and the powers of the government at that level to make laws on the subjects mentioned against each. Which of the following pairs is not correctly matched? Answer: d. Local governments – Residuary powers. Answer: 3. A, C, D, B. Question 12: Consider the following statements. Answer: c. A and B only.